It’s rare for a vegan to write about raising chickens. But I’ve recently begun spending time with a few clucky chicks who live in my local community garden. It’s not a farm. In fact, it sits right on Sunset Boulevard in Los Angeles. If you’re into the urban farming and gardening revival that’s taking hold of our country right now, chances are pretty good you know of someone raising chickens. Maybe it’s your local farmers market stand that has some locally raised chicken eggs each week. Maybe, like me, your community garden is home to some egg-layers. Or maybe you’re about to be the first house on your block to bring in some hens. While it may seem a bit strange to see chickens in an urban environment, they’re not strangers to cities. It wasn’t all that long ago (up until mid-century) that people living in metro areas often had chickens along with fruits and vegetables growing in their yards. And it makes sense; chickens will glean insects out of the yard, fertilize soil with their manure, and provide eggs for several years. 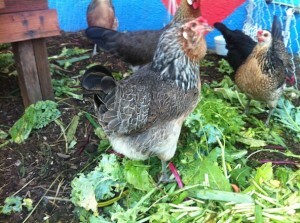 Letting chickens eat weeds and fallen leaves (those girls just love their greens) can not only help to improve your garden but decrease on your feed costs, too. Despite what you may think, chickens are actually quite intelligent and playful creatures. They enjoy being allowed to forage around a yard and can get quite friendly with humans. It can really put into perspective just how crazy it is that we raise some animals practically as children and relegate others to years of cruel and horrific confinement just to later be consumed by the deep-fried bucket load. Eggs, when humanely obtained, are the most ethical animal food product, besides scavenging up roadkill. The chickens lay them without being forced to. They’re not hooked up to machines for constant milking, or worse. Recently, Ellen DeGeneres came under scrutiny by the vegan community for saying she was eating eggs that came from her neighbor’s coop (I’m guessing Ellen’s neighbor chickens probably have a nicer home than I do). But when you consider the options—egg laying hens raised in gigantic factory farms where those curious creatures are packed into uncomfortable and unsanitary conditions—there’s little comparison. 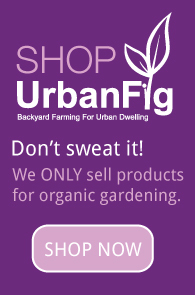 Urban yard raised chickens can’t even fathom a factory farm in their worst nightmares. Chickens, like any animal, need lots of attention and care. That means cleaning their living quarters (coops at night ward off predators and make the birds more comfortable). You’ve got to feed them well and give them space to take dust baths and forage. A chicken will typically only lay eggs for about four years. And if you’re an egg eater, the cost of caring for chickens may come out to about the same amount you’d spend on buying eggs from the market. Still, the benefits to your fruit and vegetable garden, along with knowing exactly where your eggs come from may be a worthy investment. But what about after the hen stops laying eggs? Would you kill and eat the animal? Or continue to care for her until she dies a natural death, which could be another 4-5 years or longer? Your yard can greatly benefit from this relationship, but it’s not something to take lately. Do your research. Do a lot of research. Make a smart decision and make sure you’re up for the commitment. Previous post: Cleaner Air: Benefit of Trees and Gardens or Civic Duty?